Purdue University Mackey Arena « Davis & Associates, Inc. Renovation and addition of Purdue University’s Mackey Arena. A three level Student-Athlete Development Center that includes a sports medicine facility, strength and weight training facility, oversized basketball practice facility and the “Drew and Britney Brees Student Athlete Academic Center”. 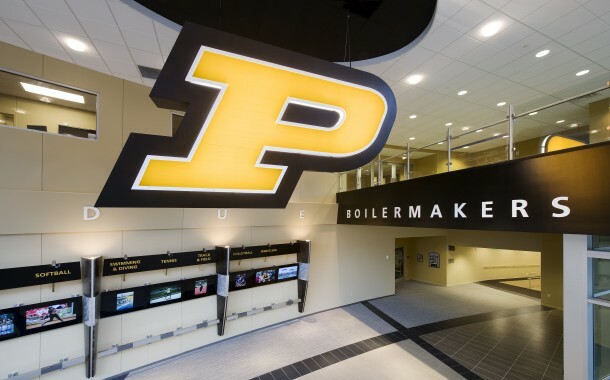 Mackey underwent a significant facelift beyond the Student Development Center. Some of these changes included nearly doubling the concourse width, quadrupling concession space, premium seating, office space, coaches and players locker room upgrades and two club spaces. Renovation encompassed phased work in eight different bid packages without interrupting sporting event schedules. Exterior site work included the relocation of the historic Grand Prix track, addition of two practice football fields, parking lots and landscaping. The Turner/Davis joint venture team successfully increased D/M/WBE participation on the Mackey Arena project exceeding expectations and goals set by Purdue University.